The scent of lavender is one of the more powerful sensory experiences of the summer herb garden. This sweet, green floral aroma with notes of camphor has the magical ability to conjure a drowsy nostalgia and memories of the past. The complex fragrance of lavender is created by the merging of roughly 180 chemicals which evolved to lure bees and other pollinators in the summer heat to the purple flowers. Indeed the plant–with its flowers (which are not quite blue, gray, lilac, or purple), its very strong fragrance, and its fine leaves and feathery growth form– is perhaps the quintessential plant of Mercury and elemental Air. There are currently about 39 recognized species in the genus Lavandula (which is part of the mint family), all of which are native to the Old World. These species include the common Old English lavender, French lavender and Spanish lavender. Lavender grows readily in the hotter drier climates of the Mediterranean and flourishes best in dry, well-drained soil in full sun. It is also cultivated in temperate gardens all over the world, but the plant can be susceptible to root rot in areas with high humidity or saturated soil. It blooms throughout the summer, and the scent is carried in the foliage as well as the flowers. Lavender has been consistently used since ancient times. Its names, both common (lavender) and scientific (Lavandula), come from the latin verb for washing, lavare. Many of it’s usages throughout history have been related to cleanliness. It has been an additive to bathing water through ancient Rome, medieval Europe, to the Victorian Era and on into the present day. Likewise, and still tied to the notion of cleanliness, lavender was used to scent linens and to keep moths and insects from clothing through all of those periods. Additionally, because the plant produces a large amount of essential oil which is easily extracted with steam distillation, lavender has long been an ingredient in the art of perfumery. In fact, it’s one of the ingredients in the popular Victorian Eau de Cologne Florida Water, which also has ties to cleanliness. In hot summers, where Victorian fashion dictated that one wore a great deal of clothing, Florida water provided a bit of cooling relief as the alcohol evaporated, and helped mask the odor of sweat. Today, Florida water continues to be popular with magicians and occultists for all manner of psychic cleansing. In addition to its cleansing properties lavender is also a useful healing herb, and healing uses were first described by the Roman physician Dioscorides in the 1st century CE. 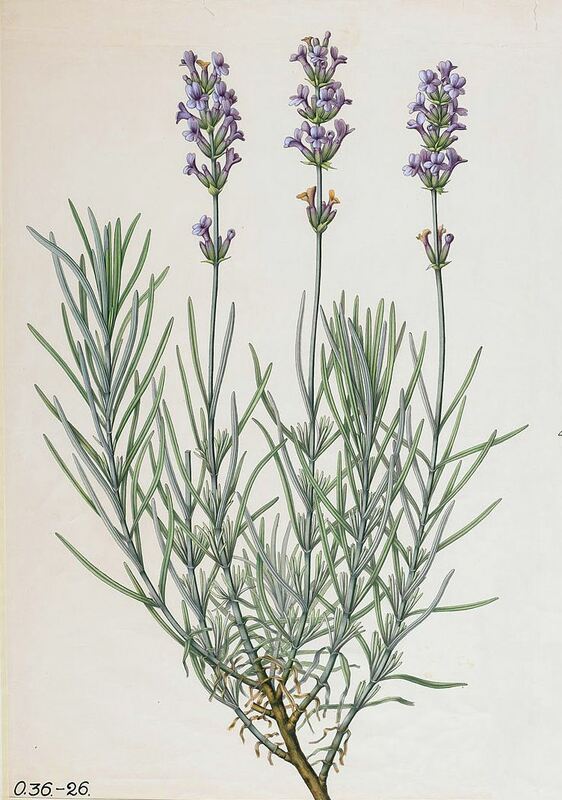 Lavender was quite popular in the medieval materia medica; the medieval herbalist and botanist Saint Hildegard of Bingen perscribed it for a number of maladies. Our old friend Nicholas Culpeper (the 17th century English herbalist) says of lavender: “Mercury owns the herb; and it carries his effects very potently”. By this he means it is an airy, balancing herb and very efficacious against the maladies of Jupiter. The diseases governed by Jupiter include apoplexy, pleurisy, diseases of the liver, piles, colds and influenza, and, in the mental sphere, restlessness and overheating of the mind. Throughout the centuries Lavender has also been prescribed for headaches, faintness, hysteric fits, panic attacks, heartaches and grief. Modernly, lavender is showing promise as an aerosolized antiviral and calming agent in some hospitals and clinics, hinting that the knowledge of physickers may not be that far off the map. It’s also being explored as an effective topical treatment for wounds and burns with anti-bacterial, anti-microbial, anti-fungal and anti-inflammatory properies. Given these associations, lavender is a lovely ingredient in many different kinds of healing spells. It is an appropriate addition to healing baths especially ones to treat fatigue and the effects of anxiety and stress. It can be added to magical ointments, poultices and potions applied externally to wounds, burns and sprains. It’s an easy herb to incorporate into healing candle spells and can be used to stuff healing poppets. Many modern sources cite lavender as an ingredient in love spells, but its inclusion in modern love spells is curious. During the middle ages, lavender was thought to cool the fires of ardour and preserve chastity. In Freeman’s Herbs for the Medieval Household, she quotes a fifteenth century German manuscript called the Hortus Sanitatis (or Garden of Health): “The Mother of God had great love of this herb for the reason that it preserves chastity…If the head is sprinkled with lavender water it will make that person chaste as long as he bears it upon him.” On the other hand, it is related that Napoleon Bonaparte’s mistress Josephine made an aphrodisiac potion by steeping lavender in milk and using it to make hot chocolate. It may be that she was, in fact, subtly trying to ensure fidelity in her partner. 19th century folklorists relate that unmarried women drink a potion of lavender on St. Lukes eve (October 17th) to dream of their future husbands. Given it’s homemaking applications (especially in scenting the marriage bed) and medieval use in ensuring chastity, I’d suggest that lavender is appropriate for certain types of love spells promoting pair bonding and fidelity. And of lavender, my nature’s got just a dash of it. To some dowager who’s wealthy rather than passionate”. This association carried through into the gay rights movement of the 1970s and the occult practitioners who were a part of it (like Herman Slater, owner of NYC’s Magical Childe) from whence it spread into popular usage. These uses aside, our personal view of the Nature of lavender is one of ease and succor and the comfort of home. We have a number of uses for it. We have added it to purification and cleansing baths, particularly those with a goal of soothing anxiety and calming frazzled nerves. We often burn lavender with frankincense as an incense to create a calm and serene atmosphere. We use it in a number of healing blends and spells, particularly our witches’ friend ointment. We spray linens with the essential oil to provide a calm, restful sleep; my grandmother used to do this, and fresh, clean, lavender-scented sheets never fail to remind me of staying at her house. Lastly, though lavender can sometimes be overwhelming in tea blends, it does have a number of culinary applications like infused honeys and cookies and cakes. These are nice to give to friends and neighbors going through a rough time and to provide comfort which is so part of lavender’s nature. All in all, lavender is a lovely and highly practical addition to any witch’s herb cupboard.